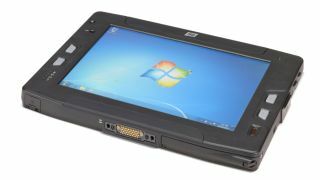 DAP Technologies has added a new rugged Windows tablet to its range in the form of the DAP MT1010. It has Windows 7 embedded but is compatible with Windows 8, and has been designed for handheld and vehicle-mounted use with I/O ports, including USB 2.0, mini USB 2.0, ethernet, serial and HDMI ports for connecting to multiple peripherals. Features include a 10.1-inch, sunlight-viewable multi-touch capacitive display with Corning Gorilla Glass 2, GPS, a gyroscope, an accelerometer and compass. The firm said this makes it suitable for mapping applications, telemetry and location based service functions. The MT1010 also includes a 1D/2D barcode scanner and standard dual autofocus cameras. A 5 MP back-facing camera with flash and a 2 MP front-facing camera make it ready for video conferencing or document scanning. Communications features include WLAN 802.11 a/b/g/n and Bluetooth v4.0. Customers can also choose the optional Gobi 3000 WWAN embedded module, which allows the tablet to connect to virtually any carrier network. The tablet includes a 64GB solid state drive, with options for 128GB, and runs on an Intel N2600 dual core 1.6GHz processor. It is sealed to IP65 and certified for a 1.8-metre drop. "With tablets continuing to claim portability superiority over laptops, DAP's new MT1010 tablet allows enterprise customers to benefit from this trend, while maintaining Microsoft Windows compatibility and I/O connectivity with legacy peripherals," said Simon Bowe, managing director of DAP Technologies.